Antibiotics for SIBO….Helpful or Harmful? Most of us with SIBO have had a long and tumultuous relationship with antibiotics. I had a recalcitrant ear infection as a one year old, which required round after round of microbiome busting antibiotics. Not to mention the spoonfuls of fun bubblegum flavored antibiotics that I continuously guzzled down throughout my childhood. I am convinced that the over consumption of antibiotics prescribed by my well meaning, but oblivious, doctors played a pivotal role in the development of my gut problems. With antibiotics being widely recognized as a contributing factor to the development of SIBO, it is ironic that treatment almost always involves taking antibiotics! Someone cue Alanis Morisette! While I have personally taken antibiotics (both herbal and pharmaceutical) for SIBO, it is always important to consider one key question: do the benefits outweigh the risks? Antibiotics have been shown to be pretty effective at temporary elimination of the bacteria in the small intestine. Rifaximin is the most widely studied antibiotic treatment for SIBO and has an eradication rate of 87-91%. That’s a pretty damn high success rate for a pharmaceutical drug! But, the success of this antibiotic seems to be short lived in many cases with relapse rates being high. 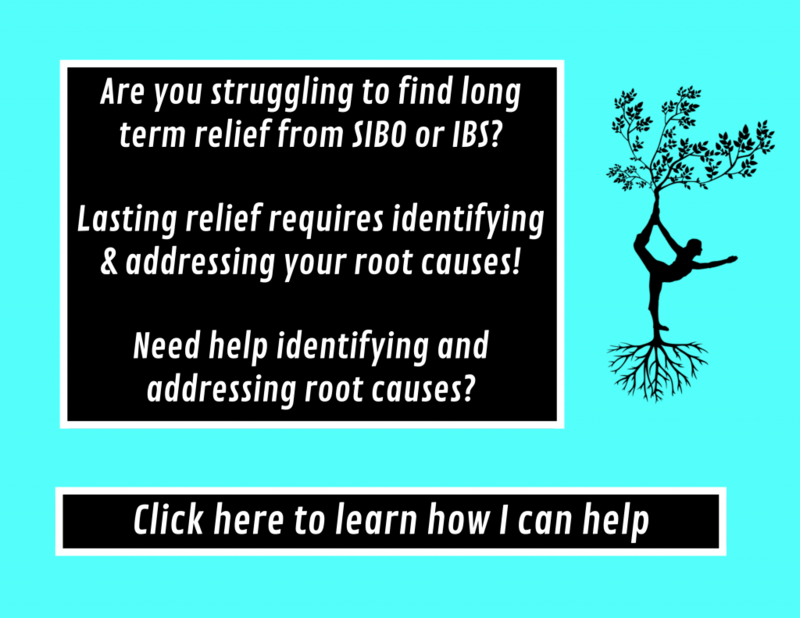 Research has shown that 13, 28, and 44 % of SIBO patients experience a relapse of their symptoms and breath test positivity at 3, 6, and 9 months after induction of remission with Rifaximin, respectably. And based on anecdotal evidence, most people relapse at some point. Pharmaceutical antibiotic treatments tend to provide symptom relief quicker than herbal or probiotic alternatives. When you are feeling bloated and miserable, sometimes you just want a quick fix. And sometimes antibiotics can even be cheaper than an herbal or probiotic based treatment plan if your insurance covers your prescription. The research seems to show that antibiotics usually are successful at clearing the small intestine, but at what cost? Unfortunately, the SIBO research doesn’t provide any information about the potential damaging effects of antibiotics on the health and function of the digestive system as a whole. It would be really interesting to have the researchers monitor colonic bacteria of SIBO patients before, during and after treatment to get a clearer idea on whether antibiotics are the best long term option for SIBO. I don’t think we can ignore the fact that while the antibiotics are killing the bacteria in the small intestine, they are also killing colonic bacteria as well. The microbial shifts that occur from antibiotics can negatively affect the environment and pH in the GI tract. The pH in the colon is crucial in maintaining balance in the GI tract to create an environment that is unhospitable to pathogens and optimal for good bacterial growth. When you tamper with this delicate pH balance, you could be opening the door to pathogenic overgrowths that can be incredibly hard to eradicate. Certain bacteria are also going to have different susceptibilities to different antibiotic agents. Some gut bugs are resistant to certain antibiotics and will opportunistically grow during treatment. These shifts lead to dysbiosis and imbalance in the large intestine. To further complicate the situation, immune signaling in the gut becomes hampered during and after antibiotic use (I will get into this more in depth in #3). With the immune system down for the count, along with the pH shifts, your colon basically becomes like the wild wild west where only the toughest meanest bacteria will thrive. You are left with your fingers tightly crossed hoping that you have some John Wayne like badass good bacteria to stave off the antibiotic fire. 2. Could trigger or exacerbate a yeast overgrowth. One issue with using antibiotics is that yeast populations will thrive during antibiotic treatment. So, you could be solving one problem and creating a whole new one. After taking a broad spectrum antibiotic for SIBO, I was like a walking yeast factory. I even took precautions to prevent it by taking an antifungal during my course of antibiotics and still experienced yeast issues. It is also important to acknowledge the prevalence of co-infections before starting antibiotics. A study that examined patients with unexplained GI symptoms found that of the participants that had an overgrowth 34% had both SIBO and SIFO (Small Intestine Fungal Overgrowth), 40% had SIBO alone and the remaining 26% had SIFO alone. So, co-infections seem relatively common. Individuals that have both fungal and bacterial overgrowths may experience a yeasty flair up after antibiotic treatment……and nobody likes a yeasty flair up! When endotoxin levels are high, the immune system attacks gut bacteria with antimicrobial peptides to reduce their population. When endotoxin levels are low, the immune system relaxes to let gut bacteria proliferate. The lazy immune system after stopping antibiotics described by the Jaminets could be a huge factor in relapse after antibiotic treatment. Some people also remain symptomatic post antibiotic even when their breath test comes back negative. I think in many of these cases, a pathogen growth due to immune dysfunction could be a culprit. I personally experienced the negative implications of a post antibiotic lazy immune system when I developed a pathogenic infection following a course of CIPRO. Antibiotics seem to just make your immune system want to Netflix and chill. When you take an antibiotic, boat loads (yes that is a scientific term) of bacteria meet their maker. As they die, they will release a boat load of endotoxins and waste products that must be detoxed by the body. The liver is abruptly flooded with all these toxins and is tasked with cleaning up all the waste. SIBO is usually already hard on the liver. When you throw an antibiotic on top of existing liver stress, your liver can become overwhelmed and start pumping excess toxins into your circulation. The waste is then usually shunted to the interstitial fluid, where the lymphatic system attempts to collect and neutralize the toxins. But since the liver is congested, the waste stagnates in the lymph and interstitial fluids. Basically, the body becomes like a toxic waste dump. Many of my SIBO peeps have experienced the dreaded “die off” reaction that happens from a clogged up liver. Pharmaceutical antibiotics are powerful bacterial killers and this can sometimes push a shaky liver over the edge. If you have read any of my other blogs, you are familiar with my continual theme that SIBO is a symptom of a different problem. The antibiotic will eliminate the overgrowth temporarily, but will not fix the underlying problem. If the root is not addressed, a relapse is imminent. Upon relapse, many jump right back on the antibiotics and thus creating a vicious cycle of antibiotic treatment. I think many doctor’s reliance on cyclical antibiotic treatment for SIBO is dangerous considering the potential disruption multiple rounds of antibiotics can have on your colonic bacteria. Reliance on continual antibiotic therapy to treat SIBO can also prove problematic, because resistance seems to develop and antibiotics lose their efficacy. I have seen time and time again people in the SIBO community discussing how awesome they felt after doing their first round. Then they have a relapse and do the same protocol and it isn’t as effective. Then in round three they double up or try a more broad spectrum antibiotic, which helps a little in the short term. Then on to round 4, 5 and 6….with no end in sight! And with each round there is a diminishing return. So, am I saying that we should never use antibiotics to treat SIBO? No, I think some cases of SIBO warrant pharmaceutical antibiotic treatment. But, I believe that antibiotics are a single tool in your SIBO tool box, but they are not the solution. As a SIBO community, we shouldn’t be satisfied with the status quo of antibiotic reliance to treat SIBO when there is a considerable amount of risk associated with chronic antibiotic use. SIBO research is in it’s infancy. The best treatment plans are still being sorted out by doctors and researchers. SIBO sufferers need to work with researchers, doctors and each other to push forward to find better more targeted solutions to treat SIBO. In the mean time, if you and your doctor decide that antibiotics are a tool that for you want to use during your SIBO treatment, I have compiled some tips that might help reduce the risk and maximize the benefits of antibiotics. While somewhat controversial, I am a huge believer in following up antibiotic treatment with the right probiotic supplement to restore proper function of both the large and small intestine. I do think the success or failure of probiotic supplementation can depend greatly on the bacterial strains chosen. In one study, when antibiotics were followed with a probiotic containing Bacillus coagulans, patients had lower relapse rates and few symptoms than the control group that didn’t take a probiotic 6 months post antibiotic treatment. As I have mentioned before, MegaSpore seems to be doing wonders for people in the SIBO community and it contains 6 strains of Bacillus species, including Bacillus coagulans. Check out my probiotics blog to learn more about why I tend to believe probiotics are crucial to regaining functional and balance in your GI tract. I would try your best to stick to Rifaximin if you have hydrogen and the combo or Rifaximin and Neomycin if you have methane. According to Dr. Pimental, Rifaximin’s becomes activated when it dissolves in the bile, which is released in the small intestine by the gall bladder to assist in fat digestion. 95% of bile is reabsorbed in the distal portion of the small intestine. Once this reabsorption occurs, according to Pimental, Rifaximin is mostly deactivated and won’t do much damage (if any) in the large intestine. Pimental has done some stool study’s on his own patients and he doesn’t find that Rifaximin changes intestinal bacteria found in the stool. But, he also says that the stool tests can’t rule out changes in the cecum, the first part of the large intestine, and the small intestine bacteria. So, as a whole, Rifaximin appears to be less damaging than most other antibiotics. I also want to take a moment to warn against using Cipro for SIBO. Cipro is an incredibly powerful antibiotic that has been black-labeled by the FDA for some nasty side effects. I think the only time anyone should consider taking it is if they have Anthrax! Taking Cipro is a huge regret of mine and I believe I am still suffering from some of the side effects of my two week round of CIPRO. Not only does it bomb your microbiome at an atomic scale, it also contains inorganic fluoride that many people will react negatively to. EVERYONE, but especially those with thyroid issues, should steer clear of CIPRO since fluoride can inhibit your thyroid function. 3. Avoid multiple rounds or long periods of pharmaceutical/herbal antibiotics. As mentioned above, doing round after round of pharmaceuticals and even herbals may not be such a great idea. With SIBO, there seems to be an optimal time frame of success when it comes to antibiotics. You want to use antibiotics/herbals to clear the bacteria from the small intestine, while limiting any eradication of good bacteria in the large intestine. If you are not on antibiotics long enough, you may not clear the over growth, but if you are on them too long you may do irreversible damage to the diversity of the microbiota in your colon. The window for success is slim and to make it more confusing is that the time frame is going to be different for each SIBO case. Working with a SIBO knowledgable practitioner can be crucial in determining the amount of time you should be on antibiotics. Re-testing with a breath test and/or an organic acids test after treatment can also help prevent over and under treatment of SIBO. I see a lot of people thinking that they still have SIBO, because they are still symptomatic after a round of antibiotics. It could be that the antibiotics didn’t wipe out the bacteria, but the symptoms could also be from an imbalance in the colon or even a yeast overgrowth. Retesting can help you more accurately determine the best course of action after antibiotics. 4. Eat prebiotics during treatment. Pimental has said that “happy and well fed bacteria are more sensitive to antibiotics and easier to kill.” This theory seems to be supported by a recent study, which showed a higher eradication rate when Rifaximin was paired with a prebiotic (guar gum) than Rifaximin alone. Many people, myself included, have made the mistake of eating a low FODMAP diet while on antibiotics, which could prevent the antibiotic from fully clearing out the small intestine bacteria. While feeding the beasties is important, I don’t think that this warrants the junk food extravaganza that some people go on during antibiotic treatment. When antibiotics are killing large amounts of bacteria, your body is working overtime to remove all the endotoxins and waste that the bacteria release when they die. Therefore, maintaining a healthy diet to help support detoxification and reduce inflammation is important. So, you should eat healthy prebiotics that you feel you can tolerate without too many symptoms. Liver and gallbladder support is an important, yet often skipped, part of antibiotic treatment for a number of reasons. First, as I mentioned above, the liver is going to be working overtime to detox the massive amount of endotoxins that are released during antibiotic treatment. It may need some extra support to handle all the die-off. Second, Rifaximin is activated by the bile that is produced by the liver and excreted by the gall bladder. So, without adequate bile, Rifaximin won’t be very effective. Making sure to eat healthy fats and supplementing to support bile production to ensure that Rifaximin can do its job. The toxins released from the bacteria being killed can create inflammation in the GI tract. In order to reduce inflammation and speed healing, you should try to control and buffer the inflammation caused by the antibiotic. Personally, I love making homemade ginger tea to help sooth my GI inflammation. Along with ginger, turmeric, glutamine and zinc can also help keep your inflammation in check. As I mentioned earlier, antibiotics can create or aggravate yeast problems. When on any antibiotic, it is best to take precautions to treat existing yeast issues or to prevent any new yeast overgrowth from developing. Taking an antifungal along with the antibiotic may be a good idea. You and your doctor can decide what antifungal would be best, whether that is a pharmaceutical like Nystatin or something a little more natural like Monolaurin or Caprylic Acid. 8. Support and strengthen your Vagus! Most people with SIBO have motility issues that are at the root of their SIBO probz! Working on strengthening the nervous signal from the brain to the gut via the vagus nerve can help you truly overcome SIBO following your antibiotic. Datis Kharrazian has an excellent video on how to strengthen your vagus. The big 3 he recommends are “aggressive” gargling (none of that light gargling nonsense haha), gagging exercises and coffee enemas. There is no doubt that an overgrowth of bacteria in the small intestine needs to be treated and antibiotics can usually accomplish a clearance of overgrowth. But, there also seems to be some interesting antidotal evidence from members of the SIBO community that a gentler approach may also work. Many people (even tough cases who have failed on antibiotic protocols) have had success using MegaSpore Biotic alone in eradicating their SIBO. The strains within this particular probiotic create many antimicrobial compounds that can attack the overgrowth in the small intestine while also helping to shape a healthy colonic environment. Unlike antibiotics that have a considerable amount of risk, MegaSpore has many benefits with virtually no risk. Personally, I believe the strong antibiotics that I took actually aggravated my long term SIBO recovery. But, MegaSpore has been a complete game changer for me. My bowel movements and symptoms are so much better. I am definitely not the only one that digs MegaSpore. If you want to see other testimonials or feedback on MegaSpore, I would highly recommend you to search the SIBO Facebook group for MegaSpore threads to see what others have to say. With many people experiencing success with MegaSpore, I think we should consider MegaSpore as a first line therapy for SIBO instead of antibiotics. It may take longer to achieve symptom relief, but I think MegaSpore is a no risk powerful actor that can help you truly heal from SIBO long term. Unlike antibiotics, that many times proves to be a short term fix. Instead of just jumping right onto antibiotics upon diagnoses, I think it would be wise to try a gentler MegaSpore approach for a couple months. If that doesn’t do the trick, then you can give antibiotics or herbals a try. That about sums it up!!! Until next time! Oh and I have a Facebook page for the SIBO DIARIES! You can click here to go like my page! Thanks so much for reading. Next post coming soon! Want to work with a SIBO knowledgeable Dietitian that can help you determine the best strategies to clear your SIBO? Contact me to set up a free 20 minute consult to see if I can help! Next Next post: Stomach Acid, PPIs and SIBO….what’s the link? What is the cheapest place for Megaspore that you have found? What a well written thoughtful article. I look forward to reading more of your posts. I am finishing my own blog post this week that I think you’ll find interesting. Cipro and it’s relatives should be taken off the market.Keep up the good work!